Malcolm Turnbull was all smiles after his overnight ascension to the prime ministership, but the fact is he has inherited some grim economic realities. It is not the fault of individual ministers, ultimately the Prime Minister has not been capable of providing the economic leadership our nation needs; he has not been capable of providing the economic confidence that business needs… Remember this: The only way, the only way, we can ensure that we remain a high wage, generous social welfare net, first-world society is if we have outstanding economic leadership, if we have strong business confidence. So, what can Turnbull do to deliver the kind of outstanding economic leadership he says Australia needs? His first step will be to acknowledge the economic problems Australia is currently facing. Since peaking in September 2011, the terms of trade have fallen by more than 30%. This is the biggest fall in the terms of trade in the last 50 years. The terms of trade refers to the ratio of the average price of exports to the average price of imports. It an indicator of a nation’s purchasing power. About 20% of Australia’s output is exported, in exchange for imports. If the price of exports falls relative to the price of imports, that is, if the terms of trade fall, Australia’s purchasing power is weakened. Since 2011, Australia’s GDP, or production, has grown by about 1% per person per year. Over the same period, Australia’s net national income has fallen by about 1% per person per year. More subtly, the terms of trade can also have an effect on employment. Imagine that the terms of trade are falling, making imports more expensive. If wages are indexed to consumer prices, which include imports, this will lead to an increase in money wages. However, producers, some of whom are exporters, are not receiving the same price increases for their output. From their point of view, rising wages lead to an uncompensated increase in the cost of labour. Thus the producers employ fewer workers, leading to an increase in unemployment. The link between the terms of trade can be broken if the labour market is sufficiently flexible to absorb a fall in money wages relative to prices. The fall in the terms of trade that we are currently experiencing has been accompanied by wage growth that has been very weak and in some cases negative. Consequently, there has not been a large increase in unemployment by historical standards. Given the circumstances, this is a positive outcome for the economy. National per capita real income has been falling for the last three and a half years. This is the most prolonged fall in national incomes in a generation. Usually, national income moves closely with national output, or GDP. 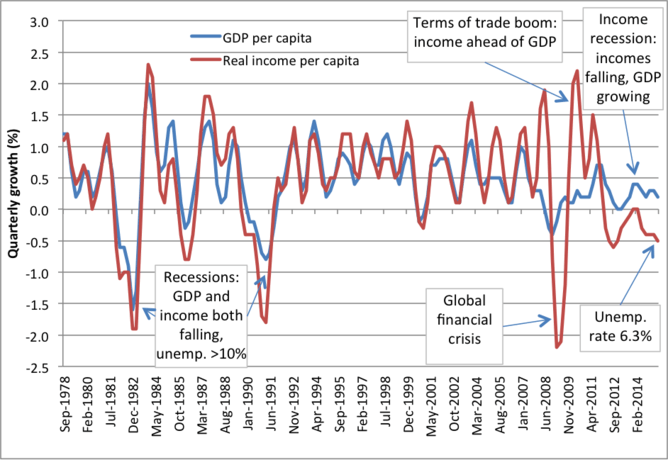 Large movements in the terms of trade have introduced a gap between income and output in recent years. During the terms of trade boom from the mid-2000’s to 2011, incomes grew faster than output because national purchasing power was strong. Now, as the terms of trade are falling, incomes are lagging behind output. During the recessions of the 1980’s and early 1990’s, falling incomes were associated with falling output and high unemployment. The pathways out of these recessions were clear, if difficult. Bring down unemployment, increase output, and thus revive incomes. This income recession is different, and somewhat inevitable. The falling terms of trade is largely beyond our control. While unemployment is at a 10-year high of 6.3%, it is nothing like the double-digit unemployment rates experienced in the 1980’s and early 1990’s. While Turnbull may be called on to “fix unemployment”, and he should certainly hope that unemployment doesn’t increase further, there is only limited scope for reducing unemployment. A reduction from 6.3% to, say 5%, won’t have quite the same effect as if the starting point had been 10%. Turnbull will need to accept that the mining boom is on the wane and plan for a transition to a new economy. The current fall in the terms of trade is attributed to large falls in the prices of major mining export commodities. Resources exports account for more than half of the value of Australia’s exports. The price of iron ore has fallen from a peak of over $US 180 per ton in 2011 to just $US50 per ton. The price of coal peaked in 2008, but since 2011 it has fallen from around $US140 a ton to just above $US60. Data from the Department of Industry shows that commodity exports have been increasing in volume terms but falling in dollar value. Rather than asking why prices are falling, in this case it may be more pertinent to ask why they were so high in the first place. 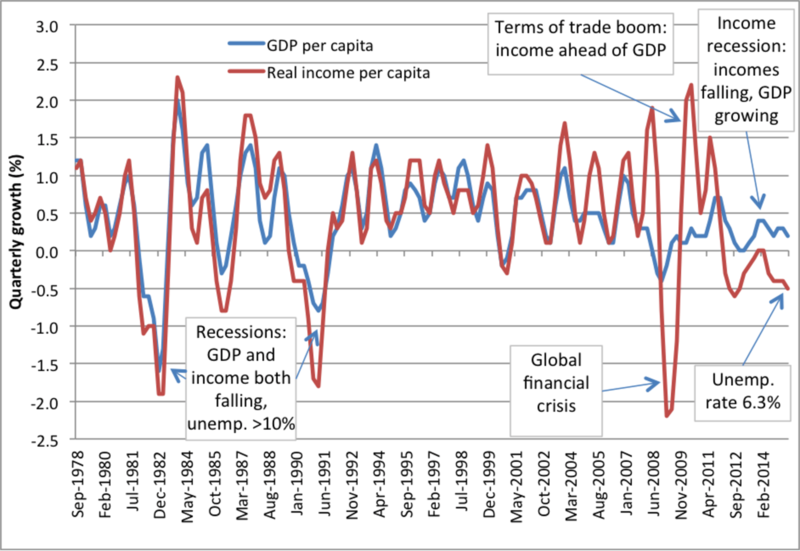 The current trajectory of the terms of trade is perhaps better described as a return to normal. In the early 2000’s, construction activity in China gave impetus to a huge increase in world demand for steel. As a producer of both iron ore and coal, Australia enjoyed significant price increases over the mid-2000’s. Over mid to late 2000’s, massive investment in mining fuelled high wages and a high Australian dollar. However, as that investment has gradually transformed into higher capital stocks, mining output has increased and prices are now falling back to their original level. It is this “transition” phase that we are now observing. The 2015 Intergenerational Report uses the assumption that Australia’s long-run terms of trade will settle at the level observed in 2005-06 by 2019-20. However, this assumption appears quite optimistic as it implies that the terms of trade will remain above its long run average in the long term. To some extent, a Turnbull government needs to accept that Australia is currently being battered by economic headwinds largely outside any government’s control. It needs to resist temptation to promise it will return the budget to surplus and instead plan for the future. That would involve a budget plan that incorporates suitable forecasts for key economic variables including the terms of trade and productivity. Overly optimistic forecasts – such as those in the last budget, which involved a doubling of productivity growth and a long-term elevation in the terms of trade – perform a disservice to good government. A plan to return the budget to balance needs to be based on a realistic reading of our current circumstances.